Today's most important question: What the F*@# should I drink? It's all covered here! We've all been there: you come home from a long day and just want to have a drink-but which drink? There are so many options, how do you decide? What the F*@# Should I Drink? has the answer! The follow-up to the wildly successful and deliciously offensive What the F*@# Should I Make for Dinner?, What the F*@# Should I Drink? provides over 75 recipes for everything from a Sidecar to a Moscow Mule to whatever the f*@# a Caipirinha is. They're easy to mix and even easier to drink, and soon you'll forget the original question. With a "choose your adventure" style recipe guide-don't like the recipe in front of you? Choose another!-and wonderfully offensive directions, What the F*@# Should I Drink? is f*@#ing fantastic, and it will make you feel f*@#ing fantastic too. 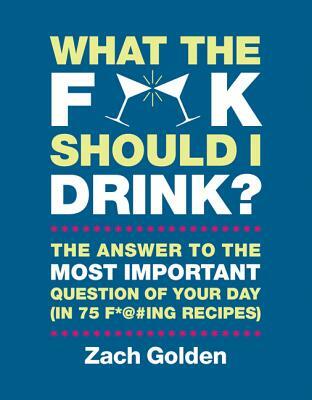 Zach Golden is a writer who grew up working and cooking in restaurants, the impetus for both his love of food and for swear words. He started whatthefuckshouldimakefordinner.com in 2010 and published What the F*@# Should I Make for Dinner? in 2011 to address his own mealtime indecision, as well as to provide a viable way to say f*@# over and over. He lives in Brooklyn, New York, with his wife Sara and dog Oscar, both of whom he allows on the furniture.